Whether talking about the constellation in the night sky or the sign of the zodiac, the word "Gemini" is synonymous with twins. It's no coincidence that Gemini is reportedly the code name for an upcoming Microsoft Office build that could be the twin project to Windows Blue. Together, the two efforts represent a complete shift in the way Microsoft develops and rolls out software. According to Mary Jo Foley, a respected authority on Microsoft with reliable inside sources, Gemini will be released inititally this fall alongside Windows Blue, with new versions of Word, Excel, PowerPoint, and OneNote. For Office, Gemini could have multiple meanings. It could even be an altogether new Microsoft Office suite, a fraternal twin to the existing Office 2013. Perhaps instead of replacing Office 2013, Gemini will be a suite of Office MX apps designed for the Windows 8 Modern interface, following in the style of the current OneNote MX. 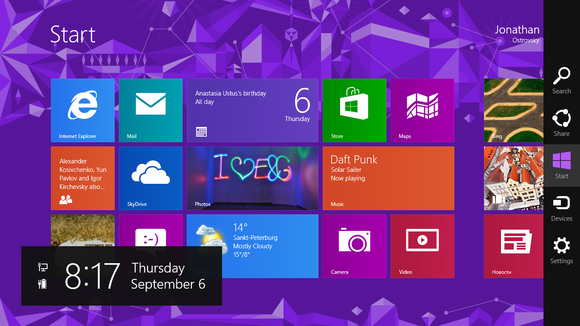 What if the next Office reflected the Windows 8 Modern interface, with its Charms bar and bold Live Tiles? The leaked Windows Blue code indicates that Microsoft has no intention of backsliding on its commitment to its Modern interface, and supports the theory that the desktop mode will fade away over time. With that in mind, expect Gemini to be built to run in the Windows 8 Modern interface rather than switching to desktop mode. Microsoft Office runs on Windows 8, but in desktop mode as opposed to as a native Windows 8 app. It makes sense for Office Gemini to be designed for Windows 8 in the style of OneNote MX, built primarily for touch input within the Windows 8 Modern UI. Bringing all of the core tools from Microsoft Office to the Modern UI is significant and necessary to get businesses and consumers to switch and start spending more time in the new interface, rather than just skipping over Windows 8's Modern screen in order to essentially run Windows 7 in desktop mode. How else could Microsoft reimagine Outlook? According to Mary Jo Foley’s sources, Gemini lacks Outlook. That would be a mistake. Outlook should be included in Gemini, as it's a crucial part of Microsoft Office, particularly for businesses. 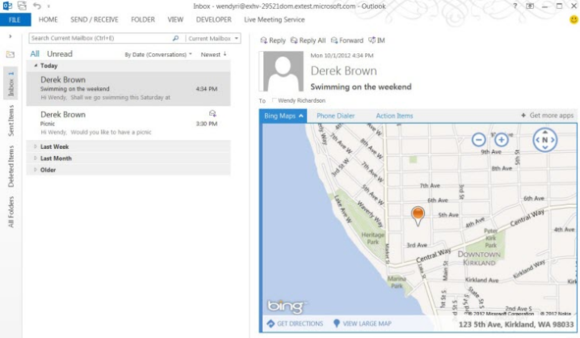 The core functions of Outlook—email, calendar, and contacts—are handled in Windows 8 by its Mail, Calendar, and People apps. Those apps have their strengths, but they don’t integrate as fully with Exchange or work as seamlessly as Outlook does. The radial menu in OneNote MX is a great innovation. The radial formatting menu in OneNote MX is genius. Microsoft took all of the formatting and features you'd normally find in a menu bar, and put them all under a single button. When you tap the button, it becomes a circle with different options to choose from and drill down into. 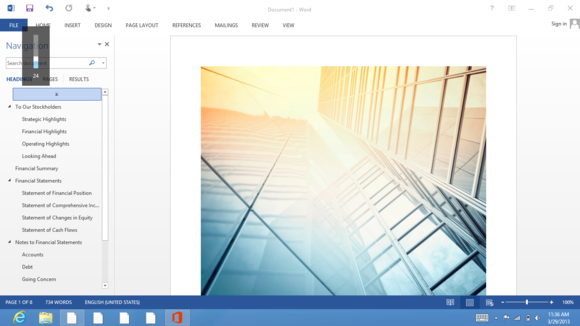 Microsoft has gone out of its way to make all of the Office 2013 desktop applications more touch-friendly, and they are. The traditional menu bar can be used in mouse mode, the way it always has, or in touch mode, which enlarges the choices and spaces them a little farther apart so they're easier to tap with a finger. However, OneNote MX offers a much better experience on a touchscreen Windows 8 tablet than OneNote 2013 does in desktop mode, and the primary reason is the radial menu. Office software like Word runs on Windows tablets only, not iOS or Android. Microsoft is facing lagging PC sales, and it’s late to the tablet party. It’s easy for Microsoft to use Office as a carrot to lure customers to buy Windows PCs, tablets, and smartphones. Holding Office hostage on Windows is a mistake, though, and will ultimately hurt Office more than it helps Windows. As it is, Microsoft Office is not entirely Windows-centric, even now. Microsoft already crossed that line in the sand when it developed Office for Mac. It makes sense to offer Office across a broad range of platforms to ensure that businesses and individuals continue to choose Office no matter what device they're working on. The tech landscape has shifted. Mac OS X computers have been chipping away, albeit slowly, at Microsoft’s virtual monopoly of the PC market, which is more or less stagnant thanks to the rising popularity of mobile devices. In both tablets and smartphones, Microsoft is a distant third place at best—far behind Android and iOS. Even if Windows Phone handsets and Windows-based tablets become wildly successful, the best Microsoft can hope for is a respectable three-way race. If Microsoft keeps Office only on Windows and Mac OS X, it will leave a majority of tablet users with no choice but to find a suitable alternative. It’s too early to say with any certainty what Microsoft has in mind for Office Gemini or Windows Blue. It appears though, that Microsoft is providing even more incentive for users to embrace the Office 365 subscription model rather than purchasinga perpetual license for Office 2013 desktop software. If major new updates are released more frequently, Office 2013 will become outdated sooner than expected. If Gemini brings Office fully into Windows 8 with enhanced touch support and Outlook included, it will help to drive sales of Windows 8 PCs and tablets, as users have more incentive to adapt and embrace the new Windows. If Gemini also includes native apps for Android and iOS, Office 365 subscriptions will skyrocket. Microsoft is potentially leaving billions of dollars of revenue on the table by not offering Office for iOS and Android. Granted, Microsoft CEO Steve Ballmer has maintained that iOS and Android users can work with Office through the browser, making native Office apps unnecessary. He's wrong. The browser versions of Office will do in a pinch, but native apps provide a better experience and work offline as well.